Instead of competing in NFL camps this week, you might find King working out in Iowa City’s sand volleyball courts. CHICAGO — Instead of competing in NFL camps this week, you might find Desmond King working out in Iowa City’s sand volleyball courts. 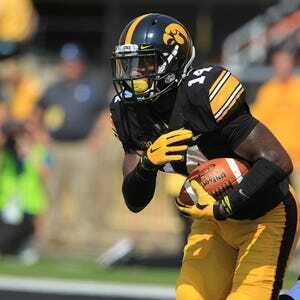 Before deciding to return to Iowa for his senior season, the all-America cornerback received that message from the NFL College Advisory Committee, which provides a clear-eyed projection to draft-eligible underclassmen that request it. “First round” is a tough grade to come by. King had been tight-lipped about the evaluation he received in late December, but divulged the NFL feedback at Tuesday’s Big Ten Conference media days. Heck, why not talk about it now? It's motivation. King’s certainly not slow. NFLDraftScout.com lists him as running a 4.53-second 40-yard dash. Whether that’s accurate doesn’t matter for his pro future now. What the clock reads in the NFL Scouting Combine next February will be the big deal. The five cornerbacks drafted in this year’s first round (Nos. 5 through 25 overall) ran between 4.37 and 4.50 at the combine. Running in heavy sand is part of the improved-speed plan for the 5-foot-11, 203-pound winner of the Jim Thorpe Award – given to college football’s top defensive back. That's part of his Chris Doyle-approved speed training, along with ladder workouts. The difference? Regularity. He’s noticing the difference, out-running teammates he didn’t used to beat. King’s stated reasons for coming back to school were to get his degree and complete unfinished business with his Hawkeye brothers. It would be a nice side bonus if, in the process, his 40 time goes down and his NFL Draft stock goes up.